The Bournemouth & Poole College has submitted a planning application for the next stages of the redevelopment of the college’s landmark Lansdowne campus and work should commence in 2018. 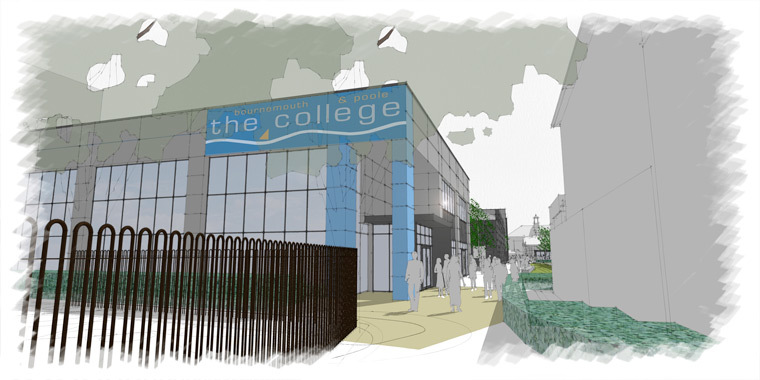 Work is expected to commence on a £10m redevelopment project at the Bournemouth & Poole College in 2018 subject to planning consent being approved by Bournemouth Borough Council. The project will ensure the campus buildings are suitable for future students, and has been designed to support the Dorset Skills Plan and Dorset Local Enterprise Partnership’s (Dorset LEP) strategic priorities. Efficient sustainable new buildings will replace inefficient wooden huts and portable buildings resulting in the modernising of student facilities and a reduction in the college’s overall carbon footprint, reduced annual running costs and additional efficiency savings. An employability and advanced apprenticeship centre, with a business support hub and facilities to support the expanding digital economy in Bournemouth is all included in the proposal. Hospitality and catering students will also have access to new catering facilities with the Escoffier restaurant relocating into a glass-fronted new building on Christchurch Road. The opportunity to segregate road traffic, providing additional soft landscaping, green features and external breakout areas between the buildings will benefit students, staff and local residents.